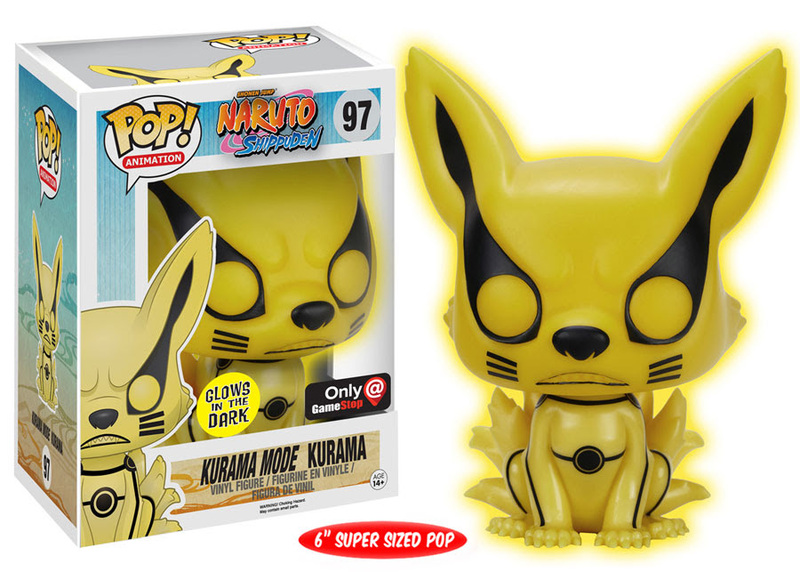 On our Naruto Message Board you discuss everything Naruto! Wednesday, May 22, 2013 With Bandai's announcement that there will be no more Naruto CCG expansions, we decided to do one last COTD. Today's Card of the Day is Never Ending Love. Beastly Mage and Turtlemanlollikepie have reviews for you today. Friday, May 10, 2013 Today's Card of the Day is Naruto Uzumaki [Tailed Beast Training]. Beastly Mage has a review for you today. Thursday, May 9, 2013 Today's Card of the Day is Rock Lee [Blooming Twice]. Beastly Mage has a review for you today. Wednesday, May 8, 2013 Today's Card of the Day is Kiba Inuzuka [Attracting Attention]. Beastly Mage and Turtlemanlollikepie have reviews for you today. Tuesday, May 7, 2013 Today's Card of the Day is Kakashi Hatake (Boyhood) [Boyhood]. Beastly Mage has a review for you today. Monday, May 6, 2013 Today's Card of the Day is Neji Hyuga [Chink in the Armor]. Beastly Mage and Turtlemanlollikepie have reviews for you today. Friday, May 3, 2013 Today's Card of the Day is Temari [Gale Force]. Beastly Mage has a review for you today. Thursday, May 2, 2013 Today's Card of the Day is The 5th Mizukage [Controlled Mist]. Beastly Mage and Turtlemanlollikepie have reviews for you today. Sad Announcement from Bandai yesterday: "Bandai America has been proud to produce the Naruto Collectible Card Game for 7 years with over 28 sets released and countless tournaments run during that time. Our latest booster set, “Ultimate Ninja Storm 3”, will be the final set released for the game. To thank our customers, we will be distributing a final promo card to participating Organized Play stores within the next few months, and the best promo we could think of was the player created card “Never Ending Love” in Gold Super Rare Foil. Please stay tuned for more details. Thanks again for all your support!" Wednesday, May 1, 2013 Today's Card of the Day is Kurotsuchi [Wild Card]. Beastly Mage and Turtlemanlollikepie have reviews for you today. Tuesday, April 30, 2013 Today's Card of the Day is Hinata Hyuga [Assisted Force]. Beastly Mage and Turtlemanlollikepie have reviews for you today. Monday, April 29, 2013 Today's Card of the Day is Tenten [Recover]. Beastly Mage and Turtlemanlollikepie have reviews for you today. Friday, April 26, 2013 Today's Card of the Day is Tailed Beast Transformation. Beastly Mage and Turtlemanlollikepie have reviews for you today. Thursday, April 25, 2013 Today's Card of the Day is Furious Tempest. Beastly Mage and Turtlemanlollikepie have reviews for you today. Wednesday, April 24, 2013 Today's Card of the Day is Empassioned Speech. Beastly Mage and Turtlemanlollikepie have reviews for you today. Tuesday, April 23, 2013 Today's Card of the Day is Destructive Duo. Beastly Mage and Turtlemanlollikepie have reviews for you today. Monday, April 22, 2013 Today's Card of the Day is Masterful User. Beastly Mage and Turtlemanlollikepie have reviews for you today. Friday, April 19, 2013 Today's Card of the Day is Shikamaru Nara [Deductive Reasoning]. Beastly Mage has a review for you today. Thursday, April 18, 2013 Today's Card of the Day is Ino Yamanak [Mental Acuity]. Beastly Mage has a review for you today. Wednesday, April 17, 2013 Today's Card of the Day is Choji Akimichi [Future Head of the Clan]. Beastly Mage has a review for you today. Tuesday, April 16, 2013 Today's Card of the Day is Ninja Alliance. Beastly Mage has a review for you today. Monday, April 15, 2013 Today's Card of the Day is Mist's Greatest Swordsmen. Beastly Mage has a review for you today. Friday, April 12, 2013 Today's Card of the Day is Nagato [Impure Resurrection]. Beastly Mage and Turtlemanlollikepie have reviews for you today. Thursday, April 11, 2013 Today's Card of the Day is Hanzo The Salamander. Beastly Mage and Turtlemanlollikepie have reviews for you today. Wednesday, April 10, 2013 Today's Card of the Day is Hidden Jutsu: Insect Bog. Beastly Mage and Turtlemanlollikepie have reviews for you today. Tuesday, April 9, 2013 Today's Card of the Day is Shino Aburame [Destruction Bugs]. Beastly Mage and Turtlemanlollikepie have reviews for you today. Monday, April 8, 2013 Today's Card of the Day is Seven Tails [Insect Beast]. Beastly Mage and Turtlemanlollikepie have reviews for you today. Friday, April 5, 2013 Today's Card of the Day is Six Tails [Slug Beast]. Beastly Mage and Turtlemanlollikepie have reviews for you today. Thursday, April 4, 2013 Today's Card of the Day is Five Tails [Dolphin Beast]. Beastly Mage and Turtlemanlollikepie have reviews for you today. 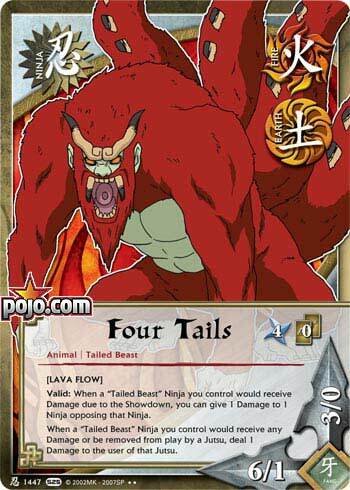 Wednesday, April 3, 2013 Today's Card of the Day is Four Tails [Monkey Beast]. Beastly Mage and Turtlemanlollikepie have reviews for you today. Tuesday, April 2, 2013 Today's Card of the Day is Three Tails [Turtle Beast]. Beastly Mage and Turtlemanlollikepie have reviews for you today. Monday, April 1, 2013 Today's Card of the Day is Two Tails [Cat Beast]. Beastly Mage and Turtlemanlollikepie have reviews for you today. Friday, March 29, 2013 Today's Card of the Day is Full Blossom: Cherry Blossom Clash. Beastly Mage and Turtlemanlollikepie have reviews for you today. Thursday, March 28, 2013 Today's Card of the Day is Master of the 7 Swords. Beastly Mage and Turtlemanlollikepie have reviews for you today. Wednesday, March 27, 2013 Today's Card of the Day is Great Blazing Eruption. Beastly Mage and Turtlemanlollikepie have reviews for you today. Tuesday, March 26, 2013 Today's Card of the Day is Flame Control Sword. Beastly Mage and Turtlemanlollikepie have reviews for you today. Monday, March 25, 2013 Today's Card of the Day is Cat Fire Bowl. Beastly Mage and Turtlemanlollikepie have reviews for you today. Friday, March 22, 2013 Today's Card of the Day is Itachi Uchiha [Impure Resurrection]. Beastly Mage and Turtlemanlollikepie have reviews for you today. Thursday, March 21, 2013 Today's Card of the Day is Obito Uchiha [Heart of the Team]. Beastly Mage and Turtlemanlollikepie have reviews for you today. Wednesday, March 20, 2013 Today's Card of the Day is Madara Uchiha [Impure Resurrection]. Beastly Mage and Turtlemanlollikepie have reviews for you today. Tuesday, March 19, 2013 Today's Card of the Day is Sakura Haruna [Prior Diagnosis]. Beastly Mage and Turtlemanlollikepie have reviews for you today. Monday, March 18, 2013 Today's Card of the Day is Naruto Uzumaki [Newfound Power]. Beastly Mage and Turtlemanlollikepie have reviews for you today. Friday, March 15, 2013 Today's Card of the Day is Killer Bee [A New Weapon]. Beastly Mage and Turtlemanlollikepie have reviews for you today. Thursday, March 14, 2013 Today's Card of the Day is Sasuke Uchiha [Darkness Within]. Beastly Mage and Turtlemanlollikepie have reviews for you today. Wednesday, March 13, 2013 Today's Card of the Day is Kakashi Hatake [Allied Shinobi Commander]. Beastly Mage and Turtlemanlollikepie have reviews for you today. Tuesday, March 12, 2013 Today's Card of the Day is The 3rd Tsuchikage [Both Scales]. Beastly Mage has a review for you today. Friday, March 8, 2013 Today's Card of the Day is Sora [Fraction of Power]. Beastly Mage and Turtlemanlollikepie have reviews for you today. Thursday, March 7, 2013 Today's Card of the Day is Rin [Emergency Situation]. Beastly Mage and Turtlemanlollikepie have reviews for you today. Wednesday, March 6, 2013 Today's Card of the Day is Sakura Haruno [Complete Team]. Beastly Mage and Turtlemanlollikepie have reviews for you today. Tuesday, March 5, 2013 Today's Card of the Day is Temari [Bold Attitude]. Beastly Mage and Turtlemanlollikepie have reviews for you today. Monday, March 4, 2013 Today's Card of the Day is Sakura Haruno [Transfer of Strength]. Beastly Mage and Turtlemanlollikepie have reviews for you today. Friday, March 1, 2013 Today's Card of the Day is Haku [Mirror Double]. Beastly Mage and Turtlemanlollikepie have reviews for you today. Thursday, February 28, 2013 Today's Card of the Day is Zabuza Momochi [Demon's Roar]. Beastly Mage and Turtlemanlollikepie have reviews for you today. Wednesday, February 27, 2013 Today's Card of the Day is Hiruko [Grand Achievement]. Beastly Mage and Turtlemanlollikepie have reviews for you today. Tuesday, February 26, 2013 Today's Card of the Day is Shizune [Medical Expert]. Beastly Mage and Turtlemanlollikepie have reviews for you today. Monday, February 25, 2013 Today's Card of the Day is Kurenai Yuhi [Controlling the Senses]. Beastly Mage and Turtlemanlollikepie have reviews for you today. Friday, February 22, 2013 Today's Card of the Day is Double Lariat. Beastly Mage and Turtlemanlollikepie have reviews for you today. Thursday, February 21, 2013 Today's Card of the Day is Summoning Jutsu: Reanimation. Beastly Mage and Turtlemanlollikepie have reviews for you today. 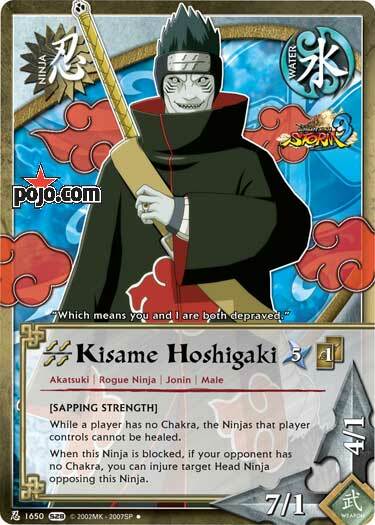 Wednesday, February 20, 2013 Today's Card of the Day is Kisame Hoshigaki [Merging]. Beastly Mage and Turtlemanlollikepie have reviews for you today. Tuesday, February 19, 2013 Today's Card of the Day is The 4th Hokage [True Leader]. Beastly Mage and Turtlemanlollikepie have reviews for you today. Monday, February 18, 2013 Today's Card of the Day is Masked Man [Tailed Beast Control]. Beastly Mage and Turtlemanlollikepie have reviews for you today. Friday, February 15, 2013 Today's Card of the Day is Killer Bee (Version 2) [Strength of Beasts]. Turtlemanlollikepie has a review for you today. Monday, February 11, 2013 Thanks to the great folks at Bandai, we have another exclusive preview from the upcoming Series 28 expansion: Ultimate Ninja Storm 3. Today's preview is Danzo [Radical Ideals] You'll find the image and our thoughts on this new card in our Card of the Day section. Beastly Mage and Turtlemanlollikepie have reviews for you today. Friday, February 8, 2013 Thanks to the great folks at Bandai, we have another exclusive preview from the upcoming Series 28 expansion: Ultimate Ninja Storm 3. Today's preview is Kisame Hoshigaki [Sapping Strength]! You'll find the image and our thoughts on this new card in our Card of the Day section. Beastly Mage and Turtlemanlollikepie have reviews for you today. Thursday, February 7, 2013 Thanks to the great folks at Bandai, we have another exclusive preview from the upcoming Series 28 expansion: Ultimate Ninja Storm 3. Today's preview is Asuma Sarutobi [Impure Resurrection]! You'll find the image and our thoughts on this new card in our Card of the Day section. Beastly Mage and Turtlemanlollikepie have reviews for you today. Tuesday, February 5, 2013 Thanks to the great folks at Bandai, we have another exclusive preview from the upcoming Series 28 expansion: Ultimate Ninja Storm 3. Today's preview is Kankuro [Commando Unit Captain]! You'll find the image and our thoughts on this new card in our Card of the Day section. Beastly Mage and Turtlemanlollikepie have reviews for you today. Monday, February 4, 2013 Thanks to the great folks at Bandai, we have an exclusive preview from the upcoming Series 28 expansion: Ultimate Ninja Storm 3. Today's preview is Sai [Imagination]! You'll find the image and our thoughts on this new card in our Card of the Day section. Beastly Mage and Turtlemanlollikepie have reviews for you today. Friday, February 1, 2013 Today's Card of the Day is Kabuto Yakushi [Intellectual Pursuit] from Series 27. Beastly Mage and Turtlemanlollikepie have reviews for you today. Thursday, January 31, 2013 Today's Card of the Day is Hidan [Everlasting Life] from Series 27. Beastly Mage and Turtlemanlollikepie have reviews for you today. Wednesday, January 30, 2013 Today's Card of the Day is Tobi [A Foreboding Feeling] from Series 27. Beastly Mage and Turtlemanlollikepie have reviews for you today. Monday, January 28, 2013 Thanks to the great folks at Bandai, we have an exclusive Super Rare preview from the upcoming Series 28 expansion: Ultimate Ninja Storm 3. Today's preview is Clash of Ideals. And it happens to be our 1500th COTD! You'll find the image and our thoughts on this new card in our Card of the Day section. Beastly Mage and Turtlemanlollikepie have reviews for you today. Friday, January 25, 2013 Today's Card of the Day is Obito Uchiha [Time of Action] from Series 27. Beastly Mage and Turtlemanlollikepie have reviews for you today. Thursday, January 24, 2013 Today's Card of the Day is Sasuke Uchiha [Genius' Privilege] from Series 27. Beastly Mage and Turtlemanlollikepie have reviews for you today. Wednesday, January 23, 2013 Today's Card of the Day is Kiba Inuzuka [The Best Trail] from Series 27. Beastly Mage and Turtlemanlollikepie have reviews for you today. Tuesday, January 22, 2013 Today's Card of the Day is Suguro [Off Guard] from Series 27. Beastly Mage and Turtlemanlollikepie have reviews for you today. Monday, January 21, 2013 Today's Card of the Day is Gentleman Cat from Series 27. Beastly Mage and Turtlemanlollikepie have reviews for you today. Friday, January 18, 2013 Today's Card of the Day is Path of the Avenger from the Series 27 expansion. Beastly Mage and Turtlemanlollikepie have reviews for you today. Thursday, January 17, 2013 Today's Card of the Day is The Future Hokage? from the Series 27 expansion. Beastly Mage and Turtlemanlollikepie have reviews for you today. Wednesday, January 16, 2013 Today's Card of the Day is A Hard Bargain from the Series 27 expansion. Beastly Mage and Turtlemanlollikepie have reviews for you today. Tuesday, January 15, 2013 Today's Card of the Day is The Power of the the Trio from the Series 27 expansion. Turtlemanlollikepie has a review for you today. Monday, January 14, 2013 Today's Card of the Day is Great Praise from the Series 27 expansion. Beastly Mage and Turtlemanlollikepie have reviews for you today. Friday, January 11, 2013 Today's Card of the Day is Deidara [Explosive Decoy] from the Series 27 expansion. Beastly Mage and Turtlemanlollikepie have reviews for you today. Thursday, January 10, 2013 Today's Card of the Day is Neji Hyuga [Genius of the Hyuga] from the Series 27 expansion. Beastly Mage and Turtlemanlollikepie have reviews for you today. Wednesday, January 9, 2013 Today's Card of the Day is Asuma Sarutobi [Knockout Punch] from the Series 27 expansion. Beastly Mage and Turtlemanlollikepie have reviews for you today. Tuesday, January 8, 2013 Today's Card of the Day is Shikamaru Nara [Tactical Paragon] from the Series 27 expansion. Beastly Mage and Turtlemanlollikepie have reviews for you today. Monday, January 7, 2013 Today's Card of the Day is Zetsu [Split Personality] from the Series 27 expansion. Beastly Mage and Turtlemanlollikepie have reviews for you today. Friday, January 4, 2013 Today's Card of the Day is The 3rd Tsuchikage [Gravity Well] from the Series 27 expansion. Beastly Mage and Turtlemanlollikepie have reviews for you today. Thursday, January 3, 2013 Today's Card of the Day is Tofu [Inside Man] from the Series 27 expansion. Beastly Mage and Turtlemanlollikepie have reviews for you today. Wednesday, January 2, 2013 Today's Card of the Day is Ino Yamanaka [Abrasive Attitude] from the Series 27 expansion. Beastly Mage and Turtlemanlollikepie have reviews for you today. Friday, December 14, 2012 Today's Card of the Day is Palm Healing from the upcoming Series 27 expansion. Beastly Mage and Turtlemanlollikepie have reviews for you today. Thursday, December 13, 2012 Today's Card of the Day is Special Kunai from the upcoming Series 27 expansion. Beastly Mage and Turtlemanlollikepie have reviews for you today. Wednesday, December 12, 2012 Today's Card of the Day is Reaper Death Seal from the upcoming Series 27 expansion. Beastly Mage and Turtlemanlollikepie have reviews for you today. Tuesday, December 11, 2012 Today's Card of the Day is Barrier Ninjutsu from the upcoming Series 27 expansion. Beastly Mage and Turtlemanlollikepie have reviews for you today. Monday, December 10, 2012 Today's Card of the Day is Overwhelming Hunger from the upcoming Series 27 expansion. Beastly Mage and Turtlemanlollikepie have reviews for you today. Friday, December 7, 2012 Today's Card of the Day is Tsunade [Breaking the Seal] from the upcoming Series 27 expansion. Beastly Mage and Turtlemanlollikepie have reviews for you today. Thursday, December 6, 2012 Today's Card of the Day is Temari [Furious Gust] from the upcoming Series 27 expansion. Beastly Mage has reviews for you today. We also welcome Turtlemanlolilikepie to the review crew today. Wednesday, December 5, 2012 Today's Card of the Day is Karin [Self Preservation] from the upcoming Series 27 expansion. Beastly Mage has reviews for you today. Tuesday, December 4, 2012 We had some communication problems yesterday, so you get a Twofer-Tuesday today. Today's Cards of the Day are Tenten & Hinata from the upcoming Series 27 expansion. Beastly Mage has reviews for you today. Wednesday, November 28, 2012 Thanks to the great folks at Bandai, we have another exclusive preview from the upcoming Series 27 expansion: Hero's Ascension. Today's preview is Kakuzu [Stitch Arts]. You'll find the image and our thoughts on this new card in our Card of the Day section. Beastly Mage has a review for you today. Tuesday, November 27, 2012 Thanks to the great folks at Bandai, we have another exclusive preview from the upcoming Series 27 expansion: Hero's Ascension. Today's preview is Sparring. You'll find the image and our thoughts on this new card in our Card of the Day section. Beastly Mage has a review for you today. Monday, November 26, 2012 Thanks to the great folks at Bandai, we have another exclusive preview from the upcoming Series 27 expansion: Hero's Ascension. Today's preview is The Lord's Convene. You'll find the image and our thoughts on this new card in our Card of the Day section. Beastly Mage has a review for you today. Thursday, November 22, 2012 Happy Thanksgiving! Thanks to the great folks at Bandai, we have another exclusive preview from the upcoming Series 27 expansion: Hero's Ascension. Today's preview is Outcast. You'll find the image and our thoughts on this new card in our Card of the Day section. Beastly Mage has a review for you today. Tuesday, November 20, 2012 Thanks to the great folks at Bandai, we have another exclusive preview from the upcoming Series 27 expansion: Hero's Ascension. Today's preview is The Power of Youth Skin. You'll find the image and our thoughts on this new card in our Card of the Day section. Beastly Mage has a review for you today. Monday, November 19, 2012 Thanks to the great folks at Bandai, we have an exclusive preview from the upcoming Series 27 expansion: Hero's Ascension. Today's preview is Shark Skin. You'll find the image and our thoughts on this new card in our Card of the Day section. Beastly Mage has a review for you today. Friday, November 16, 2012 Today's Card of the Day is Kimimaro [Battlefield of Bone] from the upcoming Series 27 expansion. Beastly Mage has a review for you today. Thursday, November 15, 2012 Today's Card of the Day is Choji Akamichi [Power of Food] from the upcoming Series 27 expansion. Beastly Mage has a review for you today. Wednesday, November 14, 2012 Today's Card of the Day is Jiraiya [The Original Sage] from the upcoming Series 27 expansion. Beastly Mage has a review for you today. Tuesday, November 13, 2012 Today's Card of the Day is Pain - Deva Path [Pursuit of Power] from the upcoming Series 27 expansion. Beastly Mage has a review for you today. Monday, November 12, 2012 Today's Card of the Day is Naruto Uzumaki [Hero of the Leaf] from the upcoming Series 27 expansion. Beastly Mage has a review for you today. Friday, November 9, 2012 Today's Card of the Day is Anko Mitarashi [Dango Special] from the Series 26 expansion. Beastly Mage has a review for you today. Thursday, November 8, 2012 Today's Card of the Day is Kusune [Defensive Prototype] from the Series 26 expansion. Beastly Mage has a review for you today. Wednesday, November 7, 2012 Today's Card of the Day is Gameru [Offensive Prototype] from the Series 26 expansion. Beastly Mage has a review for you today. Tuesday, November 6, 2012 Today's Card of the Day is The Sage [Sage's Wisdom] from the Series 26 expansion. Beastly Mage has a review for you today. Monday, November 5, 2012 Today's Card of the Day is The 6th Hokage [Pursuit of Power] from the Series 26 expansion. Beastly Mage has a review for you today. Friday, November 2, 2012 Today's Card of the Day is Pocket Dimension from the Series 26 expansion. Beastly Mage has a review for you today. Thursday, November 1, 2012 Today's Card of the Day is Desperate Power from the Series 26 expansion. Beastly Mage has a review for you today. Wednesday, October 31, 2012 Today's Card of the Day is Sakura's Confession from the Series 26 expansion. Beastly Mage has a review for you today. Tuesday, October 30, 2012 Today's Card of the Day is Turn of Phrase from the Series 26 expansion. Beastly Mage has a review for you today. Monday, October 29, 2012 Today's Card of the Day is A Rival's Challenge from the Series 26 expansion. Beastly Mage has a review for you today. Friday, October 26, 2012 Today's Card of the Day is Savior from the Series 26 expansion. Beastly Mage has a review for you today. Friday, October 25, 2012 Today's Card of the Day is Savior from the Series 26 expansion. Beastly Mage has a review for you today. Thursday, October 25, 2012 Today's Card of the Day is Wind Style: Vacuum Bullets from the Series 26 expansion. Beastly Mage has a review for you today. Wednesday, October 24, 2012 Today's Card of the Day is Paralyzing Seal from the Series 26 expansion. Beastly Mage has a review for you today. Tuesday, October 23, 2012 Today's Card of the Day is Reverse Tetragram Sealing Jutsu from the Series 26 expansion. Beastly Mage has a review for you today. Monday, October 22, 2012 Today's Card of the Day is Unorthodox Weaponry from the Series 26 expansion. Beastly Mage has a review for you today. Friday, October 19, 2012 Today's Card of the Day is Itachi Uchiha from the Series 26 expansion. Beastly Mage has a review for you today. Thursday, October 18, 2012 Today's Card of the Day is Kakashi Hatake [To Protect One's Comrades] from the Series 26 expansion. Beastly Mage has a review for you today. Wednesday, October 17, 2012 Today's Card of the Day is Hidan [Blood Bond] from the Series 26 expansion. Beastly Mage has a review for you today. Tuesday, October 16, 2012 We had a long busy weekend around here and missed the COTD yesterday, so we're giving you a twofer today! Today's Cards of the Day are Sasuke Uchiha [Desperate Avenger] & Tobi [Fledgling Akatsuki] from the Series 26 expansion. Beastly Mage has reviews for you today. Friday, October 12, 2012 Today's Card of the Day is Might Guy and Kakashi Hatake [Eternal Rivals] from the Series 26 expansion. Beastly Mage has a review for you today. Thursday, October 11, 2012 Today's Card of the Day is Akane [Old Habits] from the Series 26 expansion. Beastly Mage has a review for you today. Wednesday, October 10, 2012 Today's Card of the Day is Tamaki (Childhood) [Cat Shopkeeper] from the Series 26 expansion. Beastly Mage has a review for you today. Tuesday, October 9, 2012 Today's Card of the Day is Nango [Keen Observer] from the Series 26 expansion. Beastly Mage has a review for you today. Monday, October 8, 2012 Today's Card of the Day is Kiba Inuzuka [Man Beast Transformation] from the Series 26 expansion. Beastly Mage has a review for you today. Friday, October 5, 2012 Today's Card of the Day is Sacrifice from the Series 26 expansion. Beastly Mage has a review for you today. Thursday, October 4, 2012 Today's Card of the Day is Chidori Sword from the Series 26 expansion. Beastly Mage has a review for you today. Wednesday, October 3, 2012 Today's Card of the Day is Naruto Uzumaki Barrage from the Series 26 expansion. Beastly Mage has a review for you today. Tuesday, October 2, 2012 Today's Card of the Day is Shadow Clone Jutsu from the Series 26 expansion. Beastly Mage has a review for you today. Monday, October 1, 2012 Today's Card of the Day is Art of the Raging Lion's Mane from the Series 26 expansion. Beastly Mage has a review for you today. Friday, September 21, 2012 Today's Card of the Day is Sasuke Uchiha [To Avenge His Clan] from the Series 26 expansion. Beastly Mage has a review for you today. Thursday, September 20, 2012 Today's Card of the Day is Ko Hyuga [All Seeing Eyes] from the Series 26 expansion. Beastly Mage has a review for you today. Wednesday, September 19, 2012 Today's Card of the Day is Ko Hyuga [All Seeing Eyes] from the Series 26 expansion. Beastly Mage has a review for you today. Tuesday, September 18, 2012 Today's Card of the Day is Tonbei [Selfless Attitude] from the Series 26 expansion. Beastly Mage has a review for you today. onday, September 17, 2012 Today's Card of the Day is Shikamaru Nara [Supreme Strategist] from the Series 26 expansion. Beastly Mage has a review for you today. Friday, September 14, 2012 Today's Card of the Day is Panic Attack from the upcoming Series 26 expansion. Beastly Mage has a review for you today. Thursday, September 13, 2012 Today's Card of the Day is Taking a Hostage from the upcoming Series 26 expansion. Beastly Mage has a review for you today. Wednesday, September 12, 2012 Today's Card of the Day is Izanagi from the upcoming Series 26 expansion. Beastly Mage has a review for you today. Tuesday, September 11, 2012 Today's Card of the Day is Narrow Dodge from the upcoming Series 26 expansion. Beastly Mage has a review for you today. Tuesday, September 4, 2012 Today's Card of the Day is Tenten [Armory] from the upcoming Series 26 expansion. Beastly Mage has a review for you today. Monday, September 3, 2012 Today's Card of the Day is Chushin [Magaki Gangster] from the upcoming Series 26 expansion. Beastly Mage has a review for you today. Friday, August 31, 2012 Today's Card of the Day is Self Conversation from the upcoming Series 26 expansion. Beastly Mage has a review for you today. Thursday, August 30, 2012 Today's Card of the Day is The Ultimate Weapon from the upcoming Series 26 expansion. Beastly Mage has a review for you today. Wednesday, August 29, 2012 Today's Card of the Day is Intriguing Story from the upcoming Series 26 expansion. Beastly Mage has a review for you today. Tuesday, August 28, 2012 Today's Card of the Day is Konoha's Strongest Genin from the upcoming Series 26 expansion. Beastly Mage has a review for you today. Monday, August 27, 2012 Today's Card of the Day is A Quiet Day from the upcoming Series 26 expansion. Beastly Mage has a review for you today. Friday, August 24, 2012 Today's Card of the Day is Simulstrike from the upcoming Series 26 expansion. Beastly Mage has a review for you today. Thursday, August 23, 2012 Today's Card of the Day is Summoning Jutsu from the upcoming Series 26 expansion. Beastly Mage has a review for you today. Wednesday, August 22, 2012 Today's Card of the Day is Spontaneous Tree Summoning from the upcoming Series 26 expansion. Beastly Mage has a review for you today. Tuesday, August 21, 2012 Today's Card of the Day is Paper Bomb from the upcoming Series 26 expansion. Beastly Mage has a review for you today. Monday, August 20, 2012 Today's Card of the Day is Earth Style: Mud Wave from the upcoming Series 26 expansion. Beastly Mage has a review for you today. Friday, August 17, 2012 Today's Card of the Day is Madara Uchiha [To Obtain The Ultimate Power] from the upcoming Series 26 expansion. Beastly Mage has a review for you today. Thursday, August 16, 2012 Today's Card of the Day is HIbachi [Bully] from the upcoming Series 26 expansion. Beastly Mage has a review for you today. Wednesday, August 15, 2012 Today's Card of the Day is Asuma Sautobi [Mentor For The Future] from the upcoming Series 26 expansion. Beastly Mage has a review for you today. Tuesday, August 14, 2012 Today's Card of the Day is Neji Hyuga [Piercing Gaze] from the upcoming Series 26 expansion. Beastly Mage has a review for you today. Monday, August 13, 2012 Today's Card of the Day is Ino Yamanaka [Academy Training] from the upcoming Series 26 expansion. Beastly Mage has a review for you today. Wednesday, August 8, 2012 Today's Card of the Day is Neji Hyuga [Gifted Genius] from the upcoming Series 26 expansion. Beastly Mage has a review for you today. Tuesday, August 7, 2012 Today's Card of the Day is Choji Akimichi [Exponential Power] from the upcoming Series 26 expansion. Beastly Mage has a review for you today. Monday, August 6, 2012 Today's Card of the Day is Naruto Uzumaki (Sage Mode) [Champion of the Leaf] from the upcoming Series 26 expansion. Beastly Mage has a review for you today. Friday, August 3, 2012 Thanks t o the great folks at Bandai, we have two more exclusive preview cards from Series 26 "Avenger's Wrath". Today's preview cards are Samurai Warrior & Chakra Stream. You'll find the images and our thoughts on these new cards in our Card of the Day section. Beastly Mage has reviews for you today. Thursday, August 2, 2012 Thanks to the great folks at Bandai, we have another exclusive preview card from Series 26 "Avenger's Wrath". Today's preview card is Mifune [Skillful Mediator]. You'll find the image and our thoughts on this new card in our Card of the Day section. Beastly Mage has a review for you today. Wednesday, August 1, 2012 Thanks to the great folks at Bandai, we have another exclusive preview card from Series 26 "Avenger's Wrath". Today's preview card is The Mediator. You'll find the image and our thoughts on this new card in our Card of the Day section. Beastly Mage has a review for you today. Tuesday, July 31, 2012 Thanks to the great folks at Bandai, we have another exclusive preview card from Series 26 "Avenger's Wrath". Today's preview card is Strength in Numbers. You'll find the image and our thoughts on this new card in our Card of the Day section. Beastly Mage has a review for you today. Monday, July 30, 2012 Thanks to the great folks at Bandai, we have an exclusive preview card from Series 26 "Avenger's Wrath". Today's preview card is Ex-Samurai. You'll find the image and our thoughts on this new card in our Card of the Day section. Beastly Mage has a review for you today. Friday, July 27, 2012 Today's Card of the Day is Iou [Weapon Creator] from Series 25. Beastly Mage & ThatGuy have reviews for you today. Thursday, July 26, 2012 Today's Card of the Day is Sasuke Uchiha [Legendary Battle] from Series 25. Beastly Mage has a review for you today. Wednesday, July 25, 2012 Today's Card of the Day is Sasuke Uchiha [Peerless Genius] from Series 25. Beastly Mage & ThatGuy have reviews for you today. Tuesday, July 24, 2012 Today's Card of the Day is Yamato [Unique Style] from Series 25. Beastly Mage has a review for you today. We also welcome back ThatGuy to the review crew today. Monday, July 23, 2012 Today's Card of the Day is Akatsuchi [Stone Bodyguard] from Series 25. Beastly Mage has a review for you today. Friday, July 20, 2012 Today's Card of the Day is Shikamaru Nara [Guardian of the Will] from Series 25. Beastly Mage has a review for you today. Thursday, July 19, 2012 Today's Card of the Day is Choji Akimichi [Inner Strength] from Series 25. Beastly Mage has a review for you today. Wednesday, July 18, 2012 Today's Card of the Day is Tenten [Weapon Swap] from Series 25. Beastly Mage has a review for you today. Tuesday, July 17, 2012 Today's Card of the Day is Shikamaru [Outwit] from Series 25. Beastly Mage has a review for you today. Monday, July 16, 2012 Today's Card of the Day is Ino Yamanaka from Series 25. Beastly Mage has a review for you today. Friday, July 13, 2012 Today's Card of the Day is Battle of Attrition from Series 25. Beastly Mage has a review for you today. Thursday, July 12, 2012 Today's Card of the Day is Power of Suggestion from Series 25. Beastly Mage has a review for you today. Wednesday, July 11, 2012 Today's Card of the Day is For Vengeance from Series 25. Beastly Mage has a review for you today. Tuesday, July 10, 2012 Today's Card of the Day is The Kage Assassins from Series 25. Beastly Mage has a review for you today. Monday, July 9, 2012 Today's Card of the Day is Leader of the Bloody Mist from Series 25. Beastly Mage has a review for you today. Friday, July 6, 2012 Today's Card of the Day is Lightning Style: Emotion Wave from Series 25. Beastly Mage has a review for you today. Thursday, July 5, 2012 Today's Card of the Day is Genjutsu from Series 25. Beastly Mage has a review for you today. Monday, July 2, 2012 Today's Card of the Day is Danzo's Seal from Series 25. Beastly Mage has a review for you today. Saturday, June 29, 2012 Today's Card of the Day is Lightning Blade from Series 25. Beastly Mage has a review for you today. Thursday, June 28, 2012 Today's Card of the Day is Earth Style: Weighted Boulder Jutsu from Series 25. Beastly Mage has a review for you today. Wednesday, June 27, 2012 Today's Card of the Day is Temari [Galestorm] from Series 25. Beastly Mage has a review for you today. Tuesday, June 26, 2012 Today's Card of the Day is Shoseki [Weapon Master's Assistant] from Series 25. Beastly Mage has a review for you today. Monday, June 25, 2012 Today's Card of the Day is Hidan [Immoral Soul] from Series 25. Beastly Mage has a review for you today. Friday, June 22, 2012 Today's Card of the Day is Hinata Hyuga [Will To Protect] from Series 25. Beastly Mage has a review for you today. Thursday, June 21, 2012 Today's Card of the Day is Tayuya [Symphony] from Series 25. Beastly Mage has a review for you today. Wednesday, June 20, 2012 Today's Card of the Day is Sakura Haruno [Medical Student] from Series 25. Beastly Mage has a review for you today. Tuesday, June 19, 2012 Today's Card of the Day is Shizune [Paper Pusher] from Series 25. Beastly Mage has a review for you today. Monday, June 18, 2012 Today's Card of the Day is Temari [Sand Bodyguard] from Series 25. Beastly Mage has a review for you today. Friday, June 15, 2012 Today's Card of the Day is A Unique Exit from Series 25. Beastly Mage has a review for you today. Thursday, June 14, 2012 Today's Card of the Day is Exaggeration from Series 25. Beastly Mage has a review for you today. Wednesday, June 13, 2012 Today's Card of the Day is Untold Destruction from Series 25. Beastly Mage has a review for you today. Tuesday, June 12, 2012 Today's Card of the Day is Exhaustion from Series 25. Beastly Mage has a review for you today. Monday, June 11, 2012 Today's Card of the Day is New Orders from Series 25. Beastly Mage has a review for you today. Friday, June 8, 2012 It's Council Week! Today's Card of the Day is The Mist Council from Series 25. Beastly Mage has a review for you today. Thursday, June 7, 2012 It's Council Week! Today's Card of the Day is The Cloud Council from Series 25. Beastly Mage has a review for you today. Wednesday, June 6, 2012 It's Council Week! Today's Card of the Day is The Leaf Council from Series 25. Beastly Mage has a review for you today. Tuesday, June 5, 2012 It's Council Week! Today's Card of the Day is The Sand Council from Series 25. Beastly Mage has a review for you today. Monday, June 4, 2012 Today's Card of the Day is The Stone Council from Series 25. Beastly Mage has a review for you today. Friday, June 1, 2012 Today's Card of the Day is Amaterasu Shield from Series 25. Beastly Mage has a review for you today. Thursday, May 31, 2012 Today's Card of the Day is Particle Style: Atomic Dismantling Jutsu from Series 25. Beastly Mage has a review for you today. Wednesday, May 30, 2012 Today's Card of the Day is Wood Style: Pillar House Jutsu from Series 25. Beastly Mage has a review for you today. Tuesday, May 29, 2012 Today's Card of the Day is Sporulation Jutsu from Series 25. Beastly Mage has a review for you today. Friday, May 25, 2012 Today's Card of the Day is Kiba Inuzuka [Overfang] from Series 25. Beastly Mage has a review for you today. Thursday, May 24, 2012 Today's Card of the Day is Sabiru [Soul Sealing] from Series 25. Beastly Mage has a review for you today. Wednesday, May 23, 2012 Today's Card of the Day is Chainya [Bodyguard] from Series 25. Beastly Mage has a review for you today. Tuesday, May 22, 2012 Today's Card of the Day is Bartender Cat from Series 25. Beastly Mage has a review for you today. Monday, May 21, 2012 Today's Card of the Day is Kurotsuchi [Stone Bodyguard] from Series 25. Beastly Mage has a review for you today. Friday, May 18, 2012 Today's Card of the Day is Orochimaru from Series 25. Beastly Mage has a review for you today. Thursday, May 17, 2012 Today's Card of the Day is Tobi [Awkward Addition] from Series 25. Beastly Mage has a review for you today. Wednesday, May 16, 2012 Today's Card of the Day is Deidara [Explosive Technique] from Series 25. Beastly Mage has a review for you today. Tuesday, May 15, 2012 Today's Card of the Day is Zetsu [Infectious Spouse] from Series 25. Beastly Mage has a review for you today. Saturday, May 12, 2012 Today's Card of the Day is Neji Hyuga [Protecting the Plan] from Series 25. Beastly Mage has a review for you today. Thursday, May 10, 2012 Today's Card of the Day is Kankuro [Sand Bodyguard] from Series 25. Beastly Mage has a review for you today. Wednesday, May 9, 2012 Today's Card of the Day is Scorpion [Former Akatsuki] from Series 25. Beastly Mage has a review for you today. Tuesday, May 8, 2012 Today's Card of the Day is Ino Yamanaka, Shikamaru Nara, and Choji Akimichi [Ideal Squad] from Series 25. Beastly Mage has a review for you today. Monday, May 7, 2012 Today's Card of the Day is Kankuro, Temari, and Gaara of the Desert [Bonds of Blood] from Series 25. Beastly Mage has a review for you today. Friday, May 4, 2012 Thanks to the great folks at Bandai, we have an exclusive preview card from Series 25 "Kage Summit". This week we previewed 2 new cards from the "Tailed Beast" theme we previewed for you earlier this year. Today's preview card is Seven Tails. You'll find the image and our thoughts on this new card in our Card of the Day section. Beastly Mage has a review for you today. Thursday, May 3, 2012 Today's Card of the Day is The Nine-Tailed Fox Spirit [Ancient Disaster] from Series 25. Beastly Mage has a review for you today. Wednesday, May 2, 2012 Today's Card of the Day is The 5th Kazekage [The Wind Shadow] from Series 25. Beastly Mage has a review for you today. Tuesday, May 1, 2012 Today's Card of the Day is The 5th Mizukage [The Water Shadow] from Series 25. Beastly Mage has a review for you today. Monday, April 30, 2012 Thanks to the great folks at Bandai, we have an exclusive preview card from Series 25 "Kage Summit". This week we're previewing 2 new cards from the "Tailed Beast" theme we showed you earlier this year. Today's preview card is Four Tails. You'll find the image and our thoughts on this new card in our Card of the Day section. Beastly Mage has a review for you today. Friday, April 27, 2012 Today's Card of the Day is The 4th Raikage [The Lightning Shadow] from Series 25. Beastly Mage has a review for you today. Thursday, April 26, 2012 Today's Card of the Day is The 3rd Tsuchikage [The Earth Shadow] from Series 25. Beastly Mage has a review for you today. Thursday, April 19, 2012 We got some stuff going on Friday, so we are wrapping up with a Twofer today! Today's Cards of the Day are The 3rd Hokage [The Fire Shadow] & Darui [Cloud Bodyguard] from Series 25. Beastly Mage has reviews for you today. Wednesday, April 18, 2012 Today's Card of the Day is Itachi Uchiha [Altered Universe] from Series 25. Beastly Mage has a review for you today. Tuesday, April 17, 2012 Today's Card of the Day is Kakashi Hatake [Lightning Blade} from Series 25. Beastly Mage has a review for you today. Monday, April 16, 2012 Today's Card of the Day is Akatsuchi [Stone Bodyguard] from Series 25. Beastly Mage has reviews for you today. Friday, April 13, 2012 Today's Card of the Day is Zabuza Momochi [Victory by any Means] from Series 24. Beastly Mage has reviews for you today. Thursday, April 12, 2012 Today's Card of the Day is Kisame Hoshigaki [Shark's Grin] from Series 24. Beastly Mage has reviews for you today. Wednesday, April 11, 2012 Today's Card of the Day is Haku [Ice Mirrors] from Series 24. Beastly Mage has reviews for you today. Tuesday, April 10, 2012 Today's Card of the Day is Naruto Uzumaki (Six Tails) [Six Tails] from Series 24. Beastly Mage has reviews for you today. Monday, April 9, 2012 Today's Card of the Day is Naruto Uzumaki (Sage Mode) [Ascended] from Series 24. Beastly Mage has reviews for you today. Friday, April 6, 2012 Today's Card of the Day is Naruto Uzumaki [Wild Rage] from Series 24. Beastly Mage has reviews for you today. Thursday, April 5, 2012 Today's Card of the Day is The 6th Hokage [Ruling with a Fist] from Series 24. Beastly Mage has reviews for you today. Wednesday, April 4, 2012 Today's Card of the Day is Hidan (Curse Mode) [Linked Fate] from Series 24. Beastly Mage has reviews for you today. Tuesday, April 3, 2012 Today's Card of the Day is Itachi Uchiha [Dangerous Plan] from Series 24. Beastly Mage has reviews for you today. Monday, April 2, 2012 Today's Card of the Day is Kakashi Hatake [Veteran of War] from Series 24. Beastly Mage has reviews for you today. Friday, March 30, 2012 Today's Card of the Day is Double Headed Wolf from Series 24. Beastly Mage has reviews for you today. Thursday, March 29, 2012 Today's Card of the Day is Sasuke Uchiha [Solo Attitude] from Series 24. Beastly Mage has reviews for you today. Wednesday, March 28, 2012 Today's Card of the Day is Deidara [Controlled Demolition] from Series 24. Beastly Mage has reviews for you today. Tuesday, March 27, 2012 Today's Card of the Day is Foo [Body Transfer Trap] from Series 24. Beastly Mage has reviews for you today. Monday, March 26, 2012 Today's Card of the Day is Zetsu [Mysterious Observer] from Series 24. Beastly Mage has reviews for you today. Friday, March 23, 2012 Today's Card of the Day is The Strongest One from Series 24. Beastly Mage has reviews for you today. Thursday, March 22, 2012 Today's Card of the Day is The Hyuga Clan from Series 24. Beastly Mage has reviews for you today. Wednesday, March 21, 2012 Today's Card of the Day is The Aburame Clan from Series 24. Beastly Mage has reviews for you today. Tuesday, March 20, 2012 Today's Card of the Day is Gedo: Art of Rinne Rebirth from Series 24. Beastly Mage has reviews for you today. Monday, March 19, 2012 Today's Card of the Day is Shadows of the Past from Series 24. Beastly Mage has reviews for you today. Friday, March 16, 2012 Today's Card of the Day is Mangekyo Sharingan from Series 24. Beastly Mage has reviews for you today. Thursday, March 15, 2012 Today's Card of the Day is Gentle Step: Twin Lion Fists from Series 24. Beastly Mage has reviews for you today. Wednesday, March 14, 2012 Today's Card of the Day is Tailed Beast Sealing from Series 24. Beastly Mage has reviews for you today. Monday, March 12, 2012 Today's Card of the Day is Tenten [Loan of Steel] from Series 24. Beastly Mage has reviews for you today. Friday, March 9, 2012 Today's Card of the Day is Shikamaru Naru [Adaptability] from Series 24. Beastly Mage has reviews for you today. Thursday, March 8, 2012 Today's Card of the Day is Ino from Series 24. Beastly Mage has reviews for you today. Wednesday, March 7, 2012 Today's Card of the Day is Hinata Hyuga [Adamant Spirit] from Series 24. Beastly Mage has reviews for you today. Tuesday, March 6, 2012 Today's Card of the Day is Shikamaru Nara [Childhood] from Series 24. Beastly Mage has reviews for you today. Friday, February 24, 2012 Today's Card of the Day is Sage Art: Frog Call from Series 24. Beastly Mage has reviews for you today. Thursday, February 23, 2012 Today's Card of the Day is Frog Kumite from Series 24. Beastly Mage has reviews for you today. Wednesday, February 22, 2012 Today's Card of the Day is Wind Style: Pressure Damage from Series 24. Beastly Mage has reviews for you today. Tuesday, February 21, 2012 Today's Card of the Day is Temari [Disciple of the Sand] from Series 24. Beastly Mage has reviews for you today. Monday, February 20, 2012 Today's Card of the Day is Sasori [Master of Puppets] from Series 24. Beastly Mage has reviews for you today. Friday, February 17, 2012 Today's Card of the Day is Kimimaro (State 2) [Augmentation] from Series 24. Beastly Mage has reviews for you today. Thursday, February 16, 2012 Today's Card of the Day is Yamato [Tied Down] from Series 24. Beastly Mage has reviews for you today. Wednesday, February 15, 2012 Today's Card of the Day is Gamahiro [Contract] from Series 24. Beastly Mage has reviews for you today. Tuesday, February 14, 2012 Today's Card of the Day is Tobi [Placing the Explosives] from Series 24. Beastly Mage has reviews for you today. Monday, February 13, 2012 Today's Card of the Day is Sasuke Uchiha [Shadow of Evil] from Series 24. Beastly Mage has reviews for you today. Friday, February 10, 2012 Today's Card of the Day is Naruto Uzumaki & Jiraiya [Taking A Rest] from Series 24. Beastly Mage has reviews for you today. Thursday, February 9, 2012 Today's Card of the Day is Hinata Hyuga [Will To Survive] from Series 24. Beastly Mage has reviews for you today. Wednesday, February 8, 2012 Today's Card of the Day is Pakkun [Sense of Smell] from Series 24. Beastly Mage has reviews for you today. Tuesday, February 7, 2012 We missed the COTD yesterday, so you get a twofer Tuesday today. Today's Cards of the Day are The 1st Hokage [Resurgence] & Kurenai Yuhi [Captured Senses] from Series 24. Beastly Mage has reviews for you today. Friday, February 3, 2012 Today's Card of the Day is Kakashi Hatake [Favorite Books]#N-675 from Series 24. Beastly Mage has a review for you today. Thursday, February 2, 2012 Today's Card of the Day is Utakata [Water Training] from Series 24. Beastly Mage has a review for you today. Wednesday, February 1, 2012 Today's Card of the Day is Ino Yamanaka [Pressing] from Series 24. Beastly Mage has a review for you today. Tuesday, January 31, 2012 Today's Card of the Day is Sakura Haruno [I Can Do It] from Series 24. Beastly Mage has a review for you today. Monday, January 30, 2012 Today's Card of the Day is Pain (Deva Path) [Yin & Yang] from Series 24. Beastly Mage has a review for you today. Friday, January 27, 2012 Thanks to the great folks at Bandai, we have an exclusive preview card from Series 24 "Sage's Legacy". This week we're previewing 3 cards for you, representing a "Tailed Beast" deck. Today's preview card is Five Tails. You'll find the image and our thoughts on this new card in our Card of the Day section. Beastly Mage has a review for you today. Thursday, January 26, 2012 Thanks to the great folks at Bandai, we have an exclusive preview card from Series 24 "Sage's Legacy". This week we're previewing 3 cards for you, representing a "Tailed Beast" deck. Today's preview card is Two Tails. You'll find the image and our thoughts on this new card in our Card of the Day section. Beastly Mage & ninja_cupcakes have reviews for you today. Wednesday, January 25, 2012 Thanks to the great folks at Bandai, we have an exclusive preview card from Series 24 "Sage's Legacy". This week we'll be previewing 3 cards for you, representing a "Tailed Beast" deck. Today's preview card is Angering the Beast. You'll find the image and our thoughts on this new card in our Card of the Day section. Beastly Mage has a review for you today. Tuesday, January 24, 2012 Today's Card of the Day is Naruto Uzumaki [Tapping the Beast's Power] from Tournament Pack 4. Beastly Mage has a review for you today. Friday, January 20, 2012 Today's Card of the Day is Jiraiya [Sudden Appearance] from Tournament Pack 4. Beastly Mage has a review for you today. Thursday, January 19, 2012 Today's Card of the Day is Application of the First State from Tournament Pack 4. Beastly Mage has a review for you today. Wednesday, January 18, 2012 Today's Card of the Day is Itachi Uchiha [Formidable Visual Jutsu] from Tournament Pack 4. Beastly Mage has a review for you today. Tuesday, January 17, 2012 Today's Card of the Day is Chidori from Tournament Pack 4. Beastly Mage has a review for you today. Monday, January 16, 2012 Today's Card of the Day is Sasuke Uchiha [The Strongest Genin] from Tournament Pack 4. Beastly Mage has a review for you today. Tuesday, January 10, 2012 Today's Card of the Day is Rin [Team Healer] from the upcoming Tournament Pack 4. Beastly Mage has a review for you today. Friday, January 6, 2012 We've been counting down the Top 10 New Naruto cards of 2011. Our Card of the Day Reviewers each voted on their own Top 10 Lists. We compiled their lists and came up with an overall Pojo Top 10 List. We finish up today with #1. Today's Card of the Day is Hydro-Pump. Beastly Mage has a review for you today. Thursday, January 5, 2012 We're counting down the Top 10 New Naruto cards of 2011. Our Card of the Day Reviewers each voted on their own Top 10 Lists. We compiled their lists and came up with an overall Pojo Top 10 List. We continue today with #2. Today's Cards of the Day are Anbu [Rising Threat]/[Hidden Threat]. Beastly Mage has reviews for you today. Wednesday, January 4, 2012 We're counting down the Top 10 New Naruto cards of 2011. Our Card of the Day Reviewers each voted on their own Top 10 Lists. We compiled their lists and came up with an overall Pojo Top 10 List. We continue today with #3. Today's Cards of the Day is Kidomaru (State 2) [Game of Death]. Beastly Mage has a review for you today. Tuesday, January 3, 2012 We're counting down the Top 10 New Naruto cards of 2011. Our Card of the Day Reviewers each voted on their own Top 10 Lists. We compiled their lists and came up with an overall Pojo Top 10 List. We continue today with #4. Today's Card of the Day is Infinite Embrace. Beastly Mage has a review for you today. Monday, January 2, 2012 We're counting down the Top 10 New Naruto cards of 2011. Our Card of the Day Reviewers each voted on their own Top 10 Lists. We compiled their lists and came up with an overall Pojo Top 10 List. We continue today with #5. Today's Card of the Day is Lariat. Beastly Mage has a review for you today.